There are many reasons people want to bypass the game launcher. Whatever your reason, it is quite easy to accomplish with just a few clicks. This patch (and the one that came in the retail disc ver 1.21) introduces a new executable file. This file can launch any EP & SP executable, no matter what the last-released pack you have installed is. So, instead of always changing your shortcut to next released Pack to launch the game, we can now just use the same executable, i.e TS3W.exe from now on. 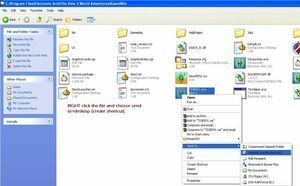 It can be found in the same /Game/Bin/ path in the base game as the original TS3.exe file as shown below. If for some reason, you have not patched to the latest updates, the method to bypass the Launcher still applies as below - you just need to use the executable for the latest-released pack you have installed eg TS3SP03.exe for Outdoor Living Stuff pack. 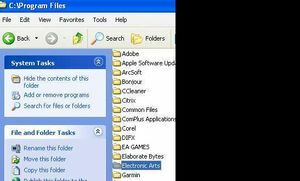 Navigate to the drive on which you have installed your game and find your program files. Note that you may have a folder called program files(x86). 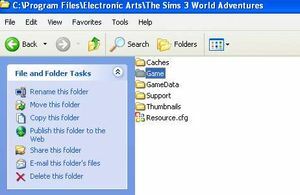 After finding your program files, click on 'electronic arts'and open the folder. Choose the game you are playing. If just the base game, choose sims 3. If you are playing an expansion pack, chose the one you are currenly playing. Open the folder. Open the GAME folder inside the folder you just opened as indicated above. Click on the BIN folder to open. Find the executable file. In this case, I am looking for the World Adventures executable. EA numbers their expansions packs. World Adventures is EP01. I will assume they will continue this practice and name the next expantion EP02 and so on. 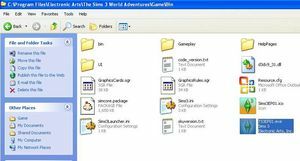 If you are playing just the base game, the .exe file will be found in program files/electronic arts/sims3/game/bin. It is named TS3.exe. 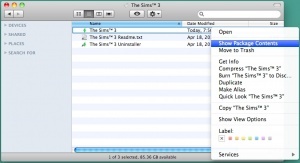 Make sure to make a backup of the files before changing them, this change may prevent the Launcher from being able to install sims3packages. 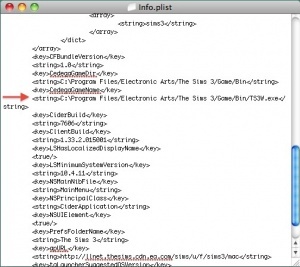 You will see a file named info.plist. Make a backup of this, then open Info.plist by dragging it onto textedit. Don't move it out of that directory! Change the last part to read TS3W.exe instead of S3Launcher.exe. Be careful not to disturb any of the rest of the file or mess with line endings. It's XML and an extra return shouldn't matter ... but you never know. NOTE: If the value in CedegaGameName is already TS3W.exe and your game still starts with the Launcher you may need to update first. By updating this changes that value to S3Launcher.exe, then you can make this change to bypass the Launcher. This page was last modified on 20 September 2012, at 10:04. This page has been accessed 223,681 times.